Powers/Abilities: Albert Poole was an amazing inventor who worked on growth serums and suits of armor. His Hulk armor was designed to lift over 100 tons (although this was not field-tested). 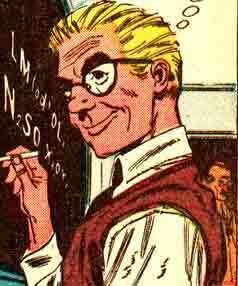 History: (Strange Tales I#75) - In college, Albert was mocked by other students because of his height, often disparingly referred to as "Shorty." He graduated with honors, and was able to set up a laboratory in the woods with an assistant, Blake. Poole intended to design a growth formula which would increase his height and thus bring an end to the mocking he had endured. When nothing came of their research, he decided to shift gears. 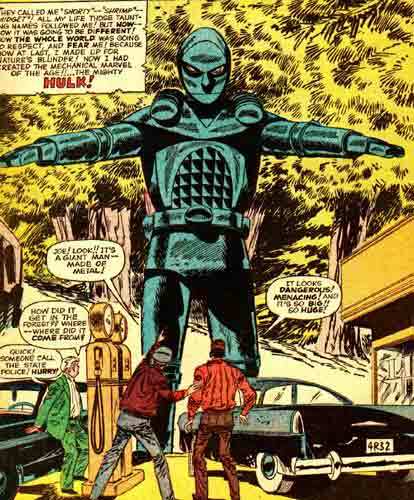 Poole decided to increase his height by different means -- he dreamed up a robotic suit of armor which he could operate, thus making him taller than any human. He and Blake set to work on the armor, but when Blake accidentally wrecked an audio impulse generator, Poole furiously drove him away. When the armor -- "the Hulk" -- was finally ready, Poole entered it, but found that he had forgotten the starter key outside. Already sealed inside the armor, Poole could not open the armor from the inside unless it was already running. The only person who knew he was there and what he was working on was Blake, whom he had already driven away. He was left with no apparent way out of his dilemma. Comments: Created by Stan Lee and Paul Reinman. This story was reprinted in Tomb of Darkness#22, with "Hulk" changed to "Grutan." Albert Poole has a modern counterpart in Professor Vic Chalker, who like Albert Poole seems to be a graduate of the Wile E. Coyote School Of Technology ;) . Blake was Albert's lab assistant, and aided him in his attempts at a growth serum and in designing the Hulk. However, Albert became furious with Blake when he accidentally dropped the audio impulse generator for the Hulk, and he drove him from the lab. When Albert became trapped inside the Hulk, Blake was the only person who knew how to save him...but was of course, nowhere to be found. In Tomb of Darkness#22, Blake was renamed "Pym"-- as in "Hank Pym." He was also given blond hair (Poole was given red hair to distinguish them). The retcon became canon in Wasp (Pym)'s profile in OHotMU A-Z HC#13.